Today I am thrilled to talk to you about one of my favorite bloggers (whose blog I cannot get enough of! ), the incredibly talented Jehanne from The Cooking Doctor. She’s a surgical doctor, wife, mother, food blogger, cookbook author, and photographer. She’s amazing, right? I don’t think there’s anything she can’t do! One day a friend called to say she wanted to come by for a visit, so I suggested brunch for the next day. It was serendipitous all around because not only was I looking forward to catching up with her, but I had been eyeing up the Blueberry Streusel Bar recipe from Jehanne’s book for a few days, and I was just looking for an opportunity to make it. The peach streusel bars were delicious and I can’t wait to try the original recipe with blueberries. I love how versatile this recipe is, and I bet just about any fruit would be wonderful. Jehanne describes this dish as “a North Indian masala-spiced scrambled egg”. I have yet to come across an Indian dish I didn’t like, so right away I knew I wanted to try this one. It’s easy to whip up and comes together very quickly. With a lovely trio of spices (including turmeric, which gives it a brilliant shade of yellow), comes a nice boost to the nutrition from the eggs and veggies. I thought this was a beautiful light meal that was perfect paired with Indian flatbread (any kind of toast would be great too!). Healthier cookies can be hard to come by, so I was intrigued when I saw this recipe, which uses extra virgin olive oil instead of butter or shortening. The cookies also have toasted pecans and dark chocolate, which is truly a match made in heaven. I loved the richness from the olive oil paired with the toasted nuttiness from the pecans and the deep, complex flavor from dark chocolate. In my opinion don’t skip the sprinkling of sea salt! As I was looking through Heart-Healthy Everyday Meals, Jehanne’s recipe for Healthy Chicken Korma immediately caught my attention. Although I love Indian dishes, korma is one that I love to order out, but had never made at home. Fate, I tell you. The thing is, when I wanted to make this recipe I was about to move overseas; instead of following the recipe exactly and buying ingredients to make it as-written, I wanted to use the recipe to help me utilize what I had on hand: onion, red bell pepper, ground chicken, and coconut milk. In the end, I made a few changes to the recipe based on what I had available in my kitchen, and I also added my own spin with a few ingredients (for example, I used garam masala spice mix instead of curry spice mix because of personal preference). Amidst stacks of boxes and piles of bins, this was the last meal I made before moving across the world…the last meal I made in a kitchen I had been cooking in for the past five years. As I broke bread with my family, I realized it was the perfect meal to make to go out with a bang. I loved the coconut milk I used in it, which provided richness (and of course healthy fat) and a bit of sweetness to cut through the spices. Normally chicken korma isn’t quite this quick to make, but ground chicken ensures that this dish is do-able even on a busy weeknight. Since I used so much onion and red bell pepper in this recipe, this one-skillet wonder can serve as a whole meal in itself. If you serve it alone and eat it like a soup, it will serve about 4; if you want to serve it along with basmati rice (or cauliflower “rice”), it will serve about 6. Jehanne recommends fresh coriander (aka cilantro) and basil as a garnish, but I just went with fresh basil since that’s what I had. Heat the oil in a large skillet over medium-high heat; add the onion and bell pepper and cook 5 minutes, stirring occasionally. Add the tomato and ground chicken, turn the heat up to high, and cook until the meat is fully cooked, about 8 minutes. Add the garlic and ginger and cook 1 minute more. Wisk together the coconut milk, almond meal, ground coriander, paprika, garam masala spice mix, salt, and pepper in a medium bowl. Add the coconut milk mixture to the skillet and bring to a simmer; simmer 1 to 2 minutes. Serve garnished with fresh basil, parsley, or cilantro leaves if desired. Recipe inspired by and adapted from Jehanne Ali's Healthy Chicken Korma recipe in Heart-Healthy Everyday Meals (Marshall Cavendish International; June 2013). I can’t speak highly enough of Jehanne’s lovely books. They are a pleasure to thumb through and an inspiration to cook from, especially if you enjoy healthy food that is every bit as delicious as it is nourishing. Disclosure: I received a free sample of Bertolli olive oil, as well as a free copy of each of Jehanne’s Heart-Healthy mini cookbooks (Marshall Cavendish International; June 2013); as always, opinions are my own. 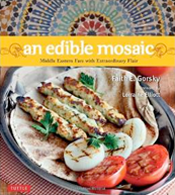 This post contains Amazon affiliate links to products I believe in, which means that even though it doesn’t cost you anything extra, I will receive a small amount of money from the sale of these items, which helps me keep this site alive – thank you for helping to support An Edible Mosaic! Fantastic food! I particularly like that egg bhurji. I am really touched that the chicken korma made it to the last supper before you moved, and thanks a lot Faith for all the mentions, *all pink now *. I am so happy that u like the books! Sounds like an amazing book! Adding to my “want” list! The book sounds interesting and so is that korma. My Korma recipe is terribly fattening… nice to see an alternative! Seriously, no matter what you post, I crave!!! This chicken dish looks so warm and hearty and just perfect for Fall dinner! I never heard of Jehanne blog but curious now, wow she has her plate full. All these recipes look so wonderful and glad you posted this delicious chicken korma, a favorite of mine.